Agriculture was the base of Chinese economy in premodern times. The Western Zhou 西周 (11th cent.-770 BCE) inherited the modes of cultivation and animal breeding as they had developed since the late Neolithic Period. Most agricultural tools were made of wood, stone, bone, or shell, but the use of bronze tools became more widespread than before. Metal spuds, hoes and sickles (qian 錢, fu 鎛, zhi 銍) are mentioned in the Classic Shijing 詩經 "Book of Songs" (part Zhousong 周頌, ode Chengong 臣工), and ploughing methods as well. Verses like "ten thousand men ploughing in pairs" (shi qian wei ou 十千維耦, ode Yixi 噫嘻) or "the ground is laid open by their ploughs; in thousands of pairs they remove the roots" (qi geng zeze, qian ou qi yun 其耕澤澤，千耦其耘, ode Zaishan 載芟) demonstrate that like during the Shang 商 (17th-11th cent. BCE) period, the farming people were commanded by agricultural officers and worked in large groups. The farmers belonged to the soil, and were part of the endowment of land to the nobility. Functionaries were given land (together with the workforce) in place of a salary, the size depending on the rank. Tracts of land were accounted in the unit tian 田 "field" which had a size of 100 mu 畝 (today 32.1 mu, or 2.14ha, see weights and measures). The Western Zhou made allegedly use of the well-field system (jingtian zhi) with clear-cut compartments divided by pathways and irrigation canals. The "multitudes" of farmers as described above were living and working on "public fiels" (gongtian 公田), but there were also private farmers which were admonished to clear the forest to reclaim new (private) land. The usual fruits of the field (baigu 百穀 "the hundred grains") were various kinds of millet, and also wheat and dry rice. Various kinds of beans added to the staple food. Hemp (dama 大麻) and ramie (zhuma 苧麻) were used to make cloth. The "Book of Songs" mentions quite a few types of vegetables and fruit trees, and silkworm cultivation as well (part Binfeng 豳風, ode Qiyue 七月). only stripping the young trees of their leaves. Weeding and fertilization are mentioned in the Book of Songs (ode Liangsi 良耜): "Clearing away the smart-weed on the dry land and wet; these weeds being decayed, the millets grow luxuriantly." (yi hao tu liao, tu liao xiu zhi, shu ji mao zhi 以薅荼蓼、荼蓼朽止、黍稷茂止。). The breeding of the "six domestic animals" (liuchu 六畜) was widespread, both at the courts of the nobility, and among the populace. The former used cows or pigs not just for food, but also for sacrifices to the ancestors. Cows and buffaloes were bred in Zhou-period China, and horses were used both as draft animals, and – by the nobility – for hunting and warfare. Horses belonged so much to the life of the aristocracy, that they were buried together with their owners, mostly along with a chariot, as can be seen in Western Zhou-period tombs from Feng 豐 and Hao 鎬 (near present-day Xi'an 西安, Shaanxi), Luoyang 洛陽, Xunxian 濬縣, Shaanxian 陝縣 (all Henan), or Fangshan 房山 (Beijing). Some aspects of horse breeding can be learnt from the Classic Zhouli 周禮, like the separation of young male horses from the mares, or that of bearing mares from the rest of the herd (part Xiaguan sima 夏官司馬, ch. Xiaoren 校人, commentary by Zheng Xuan 鄭玄; Yin, Cao 1994: 134). Domestic animals were furthermore an important source for tools. The site of Yuntang 雲塘 in Fufeng 扶風, Shaanxi, included a bone workshop with the remains of 4 tons of bone waste (Yin, Cao 1994: 133). The site of Sunzhai 孫砦 in Xinyang 信陽, Henan, brought to light an areal of fish ponds, with larger and smaller basins and quite a few creels, baskets and fish traps (yuzhao 魚罩, yulou 魚簍, zhukuang 竹筐). Rubbish pits contained not just pottery and wooden cutlery, but also paddles and oars (mujiang 木槳, mulu 木櫓), and the fragments of a small boat. The excavation of the various basins and pits also revealed the use of quite a range of seeds and kernels of fruit trees (Huang 1989). Bamboo creels or traps, wickerwork, mats and other trellis work found in Sunzhai 孫砦 in Xinyang 信陽, Henan. From Huang 1989: 50, 53. Lacquerwork was used as early as the Neolithic, and fragments of wooden vessels lacquered in red and black were found in the Shang-period sites of Erlitou 二里頭, Anyang 安陽 (Henan), and Gaocheng 藁城-Taixi 臺西 (Hebei); pieces of lacquered vessels found in Taixi were also decorated with turquois stones, such from Anyang with stones, oyster shell, or turtle shell. 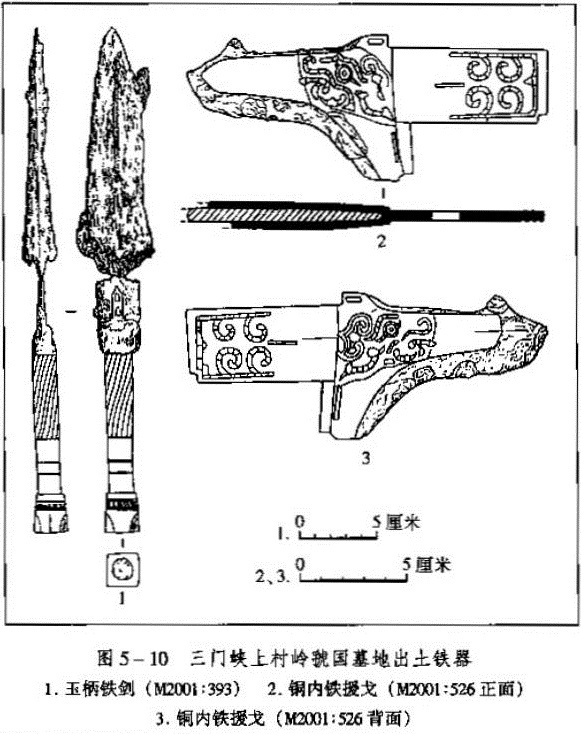 Lacquer objects were found in the Western Zhou sites of Xincun 辛村 near Junxian 浚縣, Henan, Pangjiagou 龎家溝 near Luoyang, Maojiazui 毛家咀 near Jichun 蘄春, Hubei, Zhangjiapo 張家坡 near Xi'an, Shaanxi, Yuntang close to Fufeng, Shaanxi, and Liulihe 琉璃河 near Fangshan, Beijing. The find of Liulihe was the richest, with many traditional types of vessels like gu 觚, lei 罍, dou 豆, gui 簋, pan 盤, and fangyi 方彝. Some were painted with geometrical and zoomorphical patterns, others were decorated with incrustations (xiangqian 鑲嵌) of shell squares (bangpian 蚌片) or shell disks (bangpao 蚌泡). In very rare cases, gold foil (jinbo 金箔) was used, as in a gu beaker from Liulihe. This beaker is also decorated with turquois stones, used for the eyes of a dragon, and is therefore very colourful. Apart from traditional drinking or food vessels, the early Zhou also created zoomorphical figurines made of a wood corpus (mutai 木胎) lacquered in red, brown, and black. The advance of metal tools made it possible to carve delicate patterns into the wood, to give the object a more three-dimensional structure. Grinding was an important process of smoothening the object's surface, but also to create incrustations with a thickness of but 0.2mm (Yin, Cao 1994: 145). Lacquered dou 豆 vessel of the Western Zhou period decorated with disks made of freshwater shell, unearthed in Dahekou 大河口 near Yicheng 翼城, Shanxi. The right image (6) shows the reconstruction of a dou found in Liulihe 琉璃河 near Beijing. From Hong 2018: 79. Linen and silk were the most important materials for fabric, while wool played only a subordinated role. Other plant fibers of which textiles (also such of coarse kind like mats) were made are ramie or boehmeria (zhuma 苧麻), Pueraria montana (ge 葛), Indian mallow (qing 䔛, qingma 苘麻), coarse grass or rope-rush (jian 菅), and rush (kuai 蒯). Some of these fibres had to be processed by soaking and macerating, a work pointed at in the "Book of Songs" (Chenfeng 陳風, ode Dongmen zhi chi 東門之池): Keyi qu ma, keyi qu zhu, keyi qu jian 可以漚麻。可以漚紵。可以漚菅。 "[the moat] is fit to steep hemp / boehmeria / rope-rush in". Linen fabric was used to wrap grave goods, but practically no material has survived. At least, the imprints of one or several layers of fabric were still seen in the earth around the wrapped objects during the time of excavation. Preservation is practically impossible, even if a closer investigation with electron microscope allows to identify the fabric as linen (Yin, Cao 1994: 145). An exceptional find was a whole piece of woolen fabric, along with a piece of linen, found in a tomb in Shangcunling 上村嶺 near Shaanxian 陝縣, Henan. The usual yarn standard (shazhi 紗支) for linen was 80 warp strands (jingxian 經線) per standard cloth width, corresponding to one sheng 升 of weight (see weights and measures) (Yin, Cao 1994: 146). The standard cloth width is described in the ritual Classic Yili 儀禮 (ch. Sangfu 喪服), with 2.2 chi 尺 of the time (corresponding to modern 1.5 chi or 50 m). Coarse and thin fabric with a material weight of 3 sheng per length unit was particularly used to make unadorned funeral clothes. The practical clothes of servants at the court had a weight of 7 sheng, and rich cloth for the nobility, worn during court banquets or else, had a weight of 15 to 30 sheng. 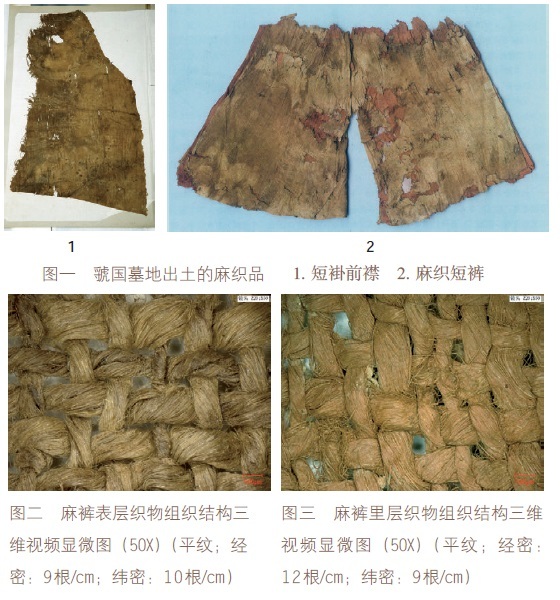 Remainders of textiles found in the site of the regional state of Guo 虢 in Sanmenxia 三門峽, Henan. Above: Front part of a jacket (1), and short trousers (2). Below: Magnification of the weaving pattern of the trousers. From Li et al. 2018: 126. Linen cloth with a width of 2.2 chi made necessary the processing of 1,200 to 2,400 warp threads, which means 24 to 48 strands per cm. The types of silk cloth mentioned in transmitted sources were manifold, reaching from juan 絹 (a kind of thick stiff silk, pongee, think silk), wan 紈 (white silk, fine silk; gauze), and bo 帛 (silks, fabrics), to zeng 繒 (fine silk fabrics), luo 羅 (gauze), jin 錦 (brocade), sha 紗 (gauze, thin silk), and hu 縠 (crepe). Bo was a typical type of cloth used as royal presents to the nobility. A tomb found in Rujiazhuang 茹家莊, Baoji 寶雞, Shaanxi, included the imprints in earth of embroidered cloth, the earliest evidence for this technique found to date. The textile had a strand density of 30×25 per cm, while the decorations had a density of 10-15 stitches per cm. Pieces of silk cloth found in Sunzhai, Xinyang, Henan, were woven with twisted yarn at that time called chou 紬 (today usually written 綢). In many cultures, meteoric iron (yuntie 隕鐵) rich in nickel was the first form of that metal with which humans became acquainted with. Yet terrestrial iron ores are rich, and as soon as humans learned to master the extraction of iron from its ores, the metal was used for weapons and agricultural tools. There were some Shang-period bronze tools found (Gaocheng, Hebei; Pinggu 平谷, Beijing) whose blades were made of meteoric iron. The same is true of the blade of an early Zhou-period yue-type 鉞 axe and that of a ge-type 戈 dagger-axe found in 1931 in Junxian 浚縣, Henan. This shows that people around 1000 BC were able to melt iron and cast it into forms. Quite outstanding is the find in 1976 in Lingshi 靈石, Shanxi, of a Shang-period axe whose blade contains as much as 8% of iron. This mixture might originate in a furnace temperature so high that iron from ores crept into the molten bronze (Yin, Cao 1994: 148). A late Western Zhou period tomb (M2001) of the regional state of Guo 虢 discovered in 1990 in Shangcunling near Shaanxian, Henan, included a 33cm-long sword with an iron blade with bronze core (tongrui 銅蕊), attached to a jade handle decorated with turquois stones. It is assumed that this is the earliest example for iron extracted from ores, and not from meteoritic material. Yet reaching the melting temperature of iron of 1540°C was still not possible at that time. The only chance to bring out iron out of the ores was the use of "block-melting" (kuailiantie 塊煉鐵, bloom) with reduction (huanyuan 還原) at a temperature of about 1000°C. Iron produced with bloomery furnaces is very impure and includes high amounts of slags of Iron(II) oxide (yanghua yatie 氧化亞鐵) and silicates (guisuanyan 硅酸鹽), and had therefore to be worked by hammering at higher temperatures before being processed (Yin, Cao 1994: 148). Sword with iron blade with bronze core attached to a jade-decorated handle (left). Ge dagger-axe with iron pick and bronze hook (right). Both found in a tomb of the lord of the regional state of Guo, Shangcunling near Sanmenxia, Henan. Zhongguo shehui kexue yuan kaogu yanjiusuo 2004: 181. The largest building of the Western Zhou period discovered so far (in 1976) is located in Fengchu 鳳雛 close to Qishan 岐山, Shaanxi. Other buildings were found in Zhaochen 召陳村 in the district of Fufeng 扶風, Shaanxi, and in Qizhen 齊鎮 nearby. These buildings are located in the home area of the Zhou dynasty, a region covering about 15km2. King Wen moved his residence away from Qishan farther east to Feng and Hao close to Xi'an. The main hall of the complex of Fengchu stood on a 45×32m-large terrace (tai 臺) of stamped earth (hangtu 夯土) which was 1.3m-high (Du 2009: 435). Because the underground consists of a southward slope, the southern part of the terrace is somewhat higher. The buildings are arranged so that the private parts were north, and the entrance and public parts in the south. The complex is inclined 10° to the west. Even if the timber of the pillars is rotten, their position and that of the walls and entrances are still clearly visible. The entrance of the complex was shielded by a wall (menping 門屏) to ward off evil spirits. The entrance way (mendao 門道) was flanked by two buildings (xishu 西塾, dongshu 東塾), before leading into a central courtyard. Steps (taijie 臺階) were leading to the main and the side buildings which were standing 30-40cm above the courtyard level. The left and right wings (xiangfang 廂房) of the complex were reached by colonnades (huilang 回廊). 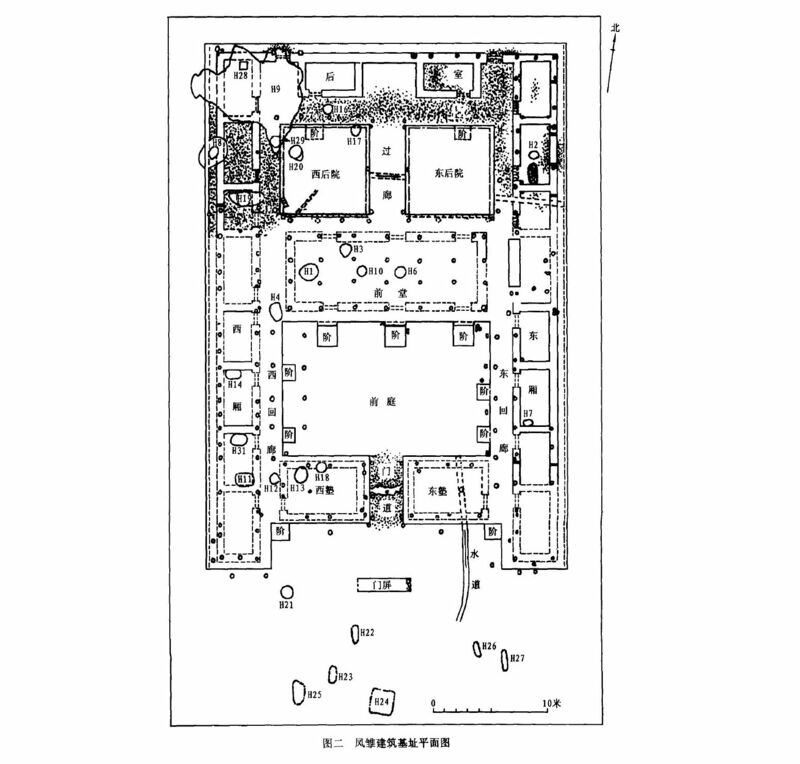 The main hall (qiantang 前堂) was perhaps divided into smaller rooms, as can be guesses from the postholes in the floor. Behind the main hall are two quadratic courtyards separated by an elevated corridor to the two buildings (houshi 後室) in the rear part. Drawing of the early Western Zhou temple-palace in Fengchu 鳳雛, district of Qishan 岐山, Shaanxi. From Du 2009: 437. Wang 2004 is of the opinion that the construction reflected the hexagram feng 豊 (the name of the royal seat), with the lines ䷶ (from bottom or the south) full (entrance) - divided (gate buildings) - full (great courtyard) - full (main hall) - divided (rear, divided courtyard) - divided (back buildings). This complex is small in comparison even to older construction work, and because ancestral temples and buildings for the living were identical in construction, the nature of this building is unknown. The arrangement is an evaluation from much older buildings found in Erlitou, and corresponds more or less to the traditional architecture of later times. Shang architecture was also the model for the use of the dewatering facilities (shuidao 水道) found in the complex of Fengchu. Two canals clad with pottery tubes were found, one leaving the large courtyard beneath the building east to the gate, and one leading eastwards from the back courtyards. The walls of the buildings were wattle-and-daub construction. Most outstanding is a real novelty perhaps invented by the Zhou, namely pottery tiles, either curved weakly (banwa 板瓦), or flected to a semi-tube (tongwa 筒瓦). Such were found in several sites of the Western Zhou period, apart from Fengchu, Zhaochen and Qizhen, also the early residences Feng and Hao, Shuigou 水溝 in Fengxiang 鳳翔, Xiliangjia 西梁家 in Chunhua 淳化 (all in Shaanxi), Liulihe 琉璃河 near Beijing, the ancient palace of the regional state of Lu 魯 in Qufu 曲阜 in Shandong, the temple of the state of Zheng 鄭 in Xinzheng 新郑 in Henan, Shituo 石沱 near Fuling 涪陵, Shuangyantang 雙堰塘 and Linjia Matou 林家碼頭 near Wushan 巫山 (all part of Chongqing), as well as Tujiazhai 余家寨 in Macheng 麻城, Dengcheng 鄧城 close to Xiangfan 襄樊, and Mopanshan 磨盤山 near Dangyang 當陽, all in Hubei (Su 2013, Fu 2018). The building of Fengchu was used throughout the Western Zhou period as a kind of temple which included a so-called "tortoise chamber" (guishi 龜室) and pits to store used oracle bones, but the date of origin is under discussion (Du 2009: 438-441). Drawings of tiles found in the remains of Western Zhou period buildings. Left: Tiles from Shituo 石沱, district of Fuling 涪陵, and from Shuangyantang 雙堰塘, district of Wushan 巫山, Chongqing. Su 2013: 6. Right: Tiles found in Qizhen 齊鎮, district of Fufeng 扶風, Shaanxi. Fu 2013: 91. The complex of the 15 buildings found in Zhaochen, used throughout the Western Zhou period – perhaps as administrative buildings, covers a surface of 2,000m2. Not all are preserved in good condition, and the relations of one building to the other as parts of a whole complex is not clear. The largest building (F8, perhaps the central one) has a dimension of 22.5×10.4m and stands on a stamped-earth terrace of 76cm (Du 2009: 442). The fundaments includes several pillar fundaments (zhuchu 柱礎) suggesting a partition of the room into three smaller chambers. The building is surrounded by a gully (sanshui 散水) plastered with pebbles (luanshi 卵石). The buildings must have been considerably taller and mightier than that of Fengchu, as can be seen in the distance (5.6m) and size of the pillars (50-70cm) (Yin, Cao 1994: 139). The largest pillars were standing on a fundament of gravel (lishi 礫石) to ensure stability. The site Yuntang 雲塘 in Fufeng includes 5 buildings, four of which seem to surround a courtyard. The largest, northern building stands on a terrace of 22×16.5m size and was divided into several rooms. Relics found in rubbish pits in the surroundings point at the late Western Zhou. The shape of the complex was compared with that of Majiazhuang 馬家莊 in Yongcheng 秦雍城. It might have been the family shrine of local aristocrats (Du 2009: 446). Very close is a similar building found in 2000 in a village called Qizhen. The terrace of the main house is 23.8×18.8m-large, and like in Yutang, two flanks embrace a courtyard (like the character 凹, but turned around). The courtyard, open to the south, is plastered with a V-shaped gravel walk (shizilu 石子路). 1.5km north of Zhaochen, in the village of Qijiacun 齊家村, are the remains of another building complex. Archaeologists discern between densely build complexes (milian shi 密聯式) and complexes with scattered buildings (sandianshi 散點式). The second type of building complex was characterized by the wide use of tiles, and of pebbles for plastering dewatering channels or footways. The buildings themselves can be divided into three types, differing in the relation width-length and the distance of the pillars inside the building from each other: not all buildings had a "hall" inside (Du 2009: 448). The fundament of a building found in Jichun 蘄春, Hubei, seems to be that of a stilt house (ganlan 干欄) (Yin, Cao 1994: 140). Inscriptions on bronze vessels are often dated. This shows how important the use of a calendar was to the Zhou. The Zhou used the system of 12 lunar months (plus one intercalary month) and the system of Celestial Stems and Terrestrial Branches as known by the Shang people. Some events described in Zhou texts even refer to one of four different stages of the moon (yuexiang 月相), namely chuji 初吉 (first day after the new moon to the 7th or 8th day), ji shengba 既生霸 (or ji shengpo 既生魄, from the 8th or 9th day to the 14th or 15th day of the month), ji wang 既望 "full moon" (from the 15th or 16th day to the 22nd or 23rd day of the month), and ji siba 既死霸 (or ji sipo 既死魄, from the 23rd day of the month to the next new moon). Early Zhou-period texts mention several starry constellations or "mansions", for instance, huo 火 (xin 心), ji 箕, dou 斗, ding 定 (shi 室, bi 必), mao 昴, bi 畢, can 參, niu 牛 or nü 女. These were progressively systematized, so that a full range of 28 constellations (ershiba xiu 二十八宿) was known during the Spring and Autumn period 春秋 (770-5th cent. BCE). The Milky Way (yinhe 銀河, tianhan 天漢) was also known in the early Zhou period. The ode Shiyue zhi jiao 十月之交 (part Xiaoya 小雅) is the first Chinese text mentioning the word shuori 朔日 "first day of the lunar month". A thing of very evil omen. The Zhouli (part Xiaguan sima 夏官司馬) explains that there were six water-testers (qiehushi 挈壺氏) in the service of the army controlling a kind of water clock. The language of the early Zhou period is rich in various geographical terms denoting types of elevations and of watery places. It is not known whether there were already maps, but the Western Zhou had a concise idea about the extent of their empire, and knew quite well that it could not be controlled from the Wei River 渭水 valley in Shaanxi. For this reason, the Zhou court toured several parts of the empire and chose, with the help of divination, to construct a secondary capital at the confluence of the rivers Yi 伊水 and Luo 落水, giving it the name Chengzhou 成周 (today's Luoyang, Henan). Clear concepts of space can also be seen in architecture as the palace of Fengchu in Qishan, whose assembly of buildings is much more complex than that of the remains of Shang-period palaces and temples. There is a want of rest, a want of good. 山冢崒崩。 The streams all bubble up and overflow. The crags on the hill-tops fall down. 胡憯莫懲。 Alas for the men of this time! How does [the king] not stop these things? Medicine in ancient times was all over the world tied to the realm of religion, and therefore, the early Spring and Autumn book Guanzi, the Classic Lunyu, or the pseudo-geography Shanhaijing mention mediums and physicians side by side. Illness was explained by the bad will of spirits and deities or as a punishment for improper conduct. Prayers and sacrifices were therefore a substantial part of a physician's practice. Finds of early "surgery" at skulls might have had such a religious background, and is not necessarily a prove for medical skills (Du & Jin 2003: 105). The word for "being ill" (ne 疒), showing a person reclining on a bed, developed into abstract concept of "illness", expressed in the multitude of words with the radical 疒 seen in the Classic Shijing that Chinese scholars divide into five groups, namely "distress" (kunku 困苦), "anxiety" (yousi 憂思), "pains" (shangtong 傷痛), epidemics and swellings (yili 疫癧), and others (Du & Jin 2003: 106). A similar abstract concept is "medical herb" or—more generally—"materia media" (yao 藥). The Shijing names a large amount of plants, but it cannot be known whether these were just eaten or served already for medical purposes. The same is true for the more than 30 seeds (most of which almonds) discovered in a Shang-period tomb in Gaocheng, Hebei. The chapter Sheyi 射儀 of the Classic Liji mentions wine (jiu, actually stout beer made of grains) as a cure for diseases. The importance of wine as the "king of medicine" is seen in the use of the radical 酉 in the character for physician, yi 醫. The book Zhouli once listed, according to the commentator Wang Yun 王育, the office of yijiu 醫酒 (perhaps a contraction of the section of physician with that of the wine supervisors). Lunyu and Liji attest the custom that a son tested medicine before a sick father consumed it. Whether massage and acupuncture were known during the Shang and Western Zhou periods, is a matter of speculation (Du & Jin 2003: 109). The Zhouli explains that the master physician of the royal court (yishi 醫師) had a staff of no less than 30 persons. Apart from this office, the Zhou court was cared four by a dietician (shiyi 食醫), a royal physician (jiyi 疾醫), a royal "surgeon" (yangyi 瘍醫) caring for ulcers, and even a veterinarian (shouyi 獸醫). The book Zhouli, even if it only came into being during the Warring States period, demonstrates that the world of religion with the supplicators (zhu 祝) and "sorcerers" or mediums (wu 巫) was separated from that of "science". The text Jizhong zhoushu 汲冢周書 (Yizhoushu 逸周書) proves the existence of a network of physicians "preparing the hundred medical herbs" in the regional states of the Zhou period. Du Jinpeng 杜金鵬 (2009). "Zhouyuan gongdian jianzhu leixing ji xiangguan wenti tantao 周原宮殿建築類型及相關問題探討", Kaogu xuebao 考古學報, 2009/4: 435-468. Du Shiran 杜石然, Jin Qiupeng 金秋鵬 (2003). Zhongguo kexue jishu shi 中國科學技術史, Vol. Tongshi 通史 (Beijing: Kexue chubanshe). Du Kezhu 杜可竹 (2014). "Shanxi Dahekou Xizhou mu chutu qimu jin guodian fuzhi 山西大河口西周墓出土漆木禁螺鈿復製", Jiang-Han kaogu 江漢考古, 2014/1: 206-210. Fu Hailong 付海龍 (2013). "Xizhou taowa faxian gaizhu 西周陶瓦發現概述", Zhuanwa 磚瓦, 91-93. Hong Shi 洪石 (2018). "Shang-Zhou luodian qiqi yanjiu 商周螺鈿漆器研究", Zhongyuan wenwu 中原文物, 2018/2: 77-90. Huang Shibin 黃士斌 (1989). "Xinyang Sunzhai yizhi fajue baogao 信陽孫砦遺址發掘報告", Huaxia kaogu 華夏考古, 1989/2: 1-68. Li Qingli 李清麗 et al. (2018). "Henan Sanmenxia Guo guo mudi M 2009 chutu ma zhipin jiance fenxi 河南三門峽虢國墓地Ｍ２００９出土麻織品檢測分析", Zhongyuan wenwu 中原文物, 2018/4: 125-128. Li Shuqian 李書謙 (2006). "Guo Ji mu chutu de yubing tiejian de tongnei tiehuan ge 虢季墓出土的玉柄鐵劍和銅内鐵援戈", Zhongyuan wenwu 中原文物, 2006/6: 92-93. Li Yang 李颺, Li Zude 李祖德 (1999). "Zhongguo gudai kuailiantie jishu 中國古代塊煉鐵技術", Fenmo yejin cailiao kexue yu gongcheng 粉末冶金材料科學與工程, 1999/1: 1-9. Shaanxi Zhouyuan kaogudui 陝西周原考古隊 (1979). "Shaanxi Qishan Fengchucun Xizhou jianzhu jizhi fajue jianbao 陝西岐山鳳雛村西周建築基址發掘簡報高", Wenwu 文物, 1979/10: 27-37. Song Xiaofei 宋笑飛, Liu Baoguo 劉保國 (2018). "Yi jian Guo guo mudi chutu de canxing qu wanshi 一件虢國墓地出土的蠶形玉腕飾", Wenwu jianding yu jianshang 文物鑑定與鑑賞, 2018/02. Su Hui 粟慧 (2013). "Sanxia diqu Xizhou Dongzho shqi wacai de kaogu faxian yu yanjiu 三峽地區西周東周時期瓦材的考古發現與研究", Sanxia daxue xuebao (Renwen shehui kexue ban) 三峽大學學報（人文社會科學版）, 2013/6: 5-11. Wang Entian 王恩田 (1981). "Qishan Fengchucun Xizhou jianzhu qun jizhi de youguan wenti 岐山鳳雛村西周建築群基址的有關問題", Wenwu 文物, 1981/1: 75-80. Wang Mingli 王明利 (1996). "Cong kaogu faxian kan Shangdai he Xizhou shiqi de qiqi 從考古發現看商代和西周時期的漆器", Wenbo 文博, 1996/5: 32-35. Wang Wei 王巍 (1987). "Guanyu Xizhou qiqi de ji ge wenti 關於西周漆器的幾個問題", Kaogu 考古, 1987/8: 734-744. Wang Xiansheng 王先勝 (2004). "Fengchu jiazu jianzhu yizhi xingzhi tantao 鳳雛甲組建築遺址性質探討", Yantai shifan daxue xuebao (Zhexue shehui kexue ban) 煙臺師範大學學報（哲學社會科學版）: 2004/2: 33-35. Wu Hao 吳昊 (2013). "Dahekou Xizhou mu bangshi xiangqian qi mudou de fuzhi jishu yanjiu 大河口西周墓蚌飾鑲嵌漆木豆的復製技術研究", Zhongguo shengqi 中國生漆, 2013/4: 37-39. Yin Weizhang 殷瑋璋 (1984). "Ji Beijing Liulihe yizhi chutu de Xizhou qiqi 記北京琉璃河遺址出土的西周漆器", Kaogu 考古, 1984/5: 449-467. Zhang Feilong 張飛龍, Wu Hao 吳昊 (2017). "Xian-Qin qiqi de zhongyao kaogu faxian 先秦漆器的重要考古發現", Part 1, "Xia-Shang zhi Xizhou shiqi 夏商至西周時期", Zhongguo shengqi 中國生漆, 2017/4: 1-8. Zhang Guoshuo 張國碩, Tang Jiejuan 湯潔娟 (2017). "Zhongyuan diqu zaoqi yetie wenti fenxi 中原地區早期冶鐵問題分析", Zhongyuan wenwu 中原文物, 2017/2: 64-69. Zhang Yanxiu 張彦修 (1994). "Shangcunling Guo guo mudi tieqi de lishi kaocha 上村嶺虢國墓地鐵器的歷史考察", Xinyang shifan xueyuan xuebao (Zhexue shehui kexue ban 信陽師範學院學報（哲學社會科學版）, 1994/3: 42-45. Zhang Yongshan 張永山 (1988). "Xizhou qiqi gaishu 西周漆器概述", Huaxia kaogu 華夏考古, 1988/2: 69-75. Zhongguo shehui kexue yuan kaogu yanjiusuo 中國社會科學院考古研究所, ed. (2004) Zhongguo kaoguxue 中國考古學, Vol. Liang Zhou 兩周 (Beijing: Zhongguo shehui kexue chubanshe).